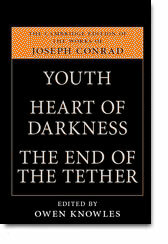 Joseph Conrad, Youth, Heart of Darkness, The End of the Tether, ed. Owen Knowles. Cambridge: Cambridge University Press, 2010. This review-essay is available in .pdf format (Acrobat Reader required): John Lyon.